Can honey bees really be trained to detect cancer in ten minutes? A Portuguese designer has created a contraption which she says can detect cancer using trained bees. The bees are placed in a glass chamber which the patient exhales from. If the bees fly into a secondary chamber, then that means the bees have detected the disease, according to Susana Soares. Miss Soares, who presented her Bee’s project at Dutch Design Week, in Eindhoven last month, said: ‘Trained bees only rush into the smaller chamber if they detect the odour on the patient’s breath that they have been trained to target. Scientists have discovered that honey bees have an excellent sense of smell which is better than a sniffer dog. Bees can be trained to detect bombs and one company called Insectinel is training ‘sniffer bees’ to work in counter-terrorist operations. 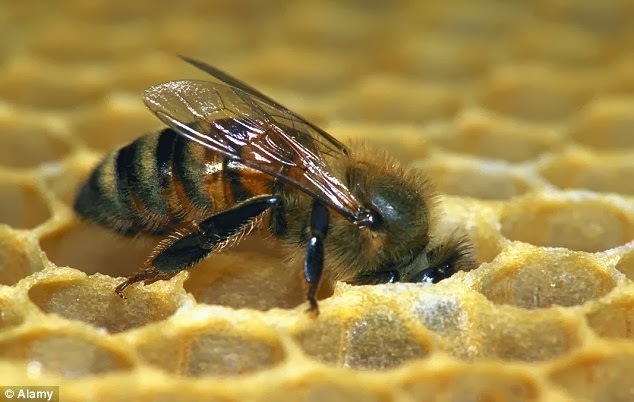 A bee is trained by exposing it to certain odours before feeding them a solution of water and sugar. The bees then remember the smell for the rest of their lives if they are always rewarded with sugar. The glass object has a big chamber and a small chamber where the bees go if they detect the disease. Research carried out by scientists has suggested that bees can accurately diagnose diseases such as tuberculosis, lung and skin cancer as well as diabetes.